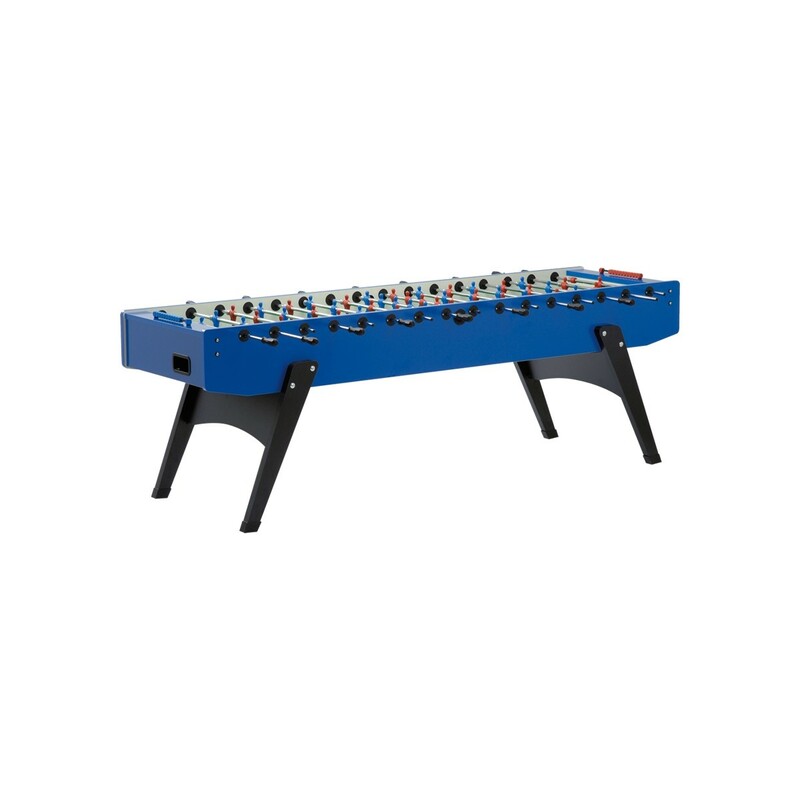 This extra large 8-player Garlando XXL Outdoor Foosball Table offers increased fun and even more interesting actions, thanks to a longer playing field. Its cabinet reproduces the G-2000 elegant shape, in the same blue color and sleek inclined legs. 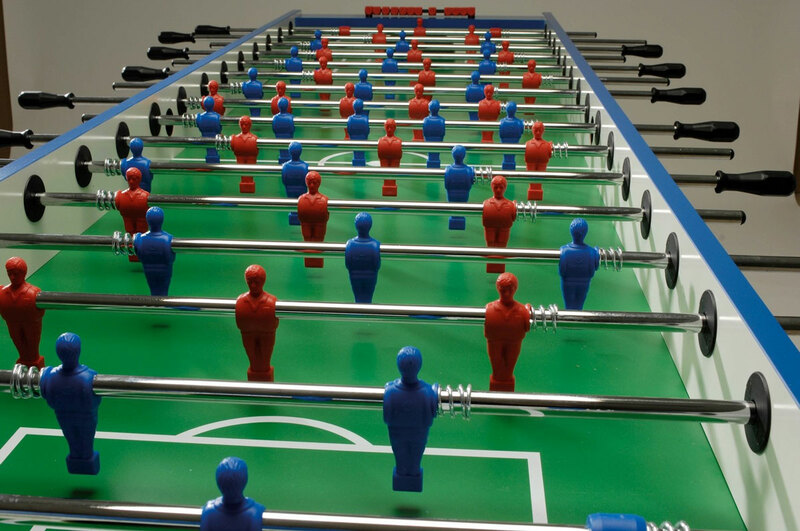 Suitable to accommodate and amuse larger groups of players, the XXL will also befit marketing events and advertising purposes. Telescopic safety bars provide greater safety if used in schools and playgrounds where small children are around. Sturdy cabinet constructed of marine plywood, special anti-rust steels and waterproof glues. Slanted legs with a cross-piece in 2-1/2- inch MDF coated with melamine provides great stability. High stress resistance machine-trued telescopic hollow steel bars - diameter 16mm - coated with anti-rust chromium-plating. The quality of the materials adds to the thickness of 2.2mm to prevent the bars from bending: they maintain a perfect shape for a long time. In telescopic bars a smaller diameter bar glides inside the player bar, whose end does not protrude from the cabinet. This prevents dangerous strikes to the children’s eyes and face. Bars are fixed to the cabinet by means of nylon ball bearings. The steel roller bearings inside the bearings fixing bars to the cabinet greatly improve the game speed, while reducing the stress for the players' wrists. 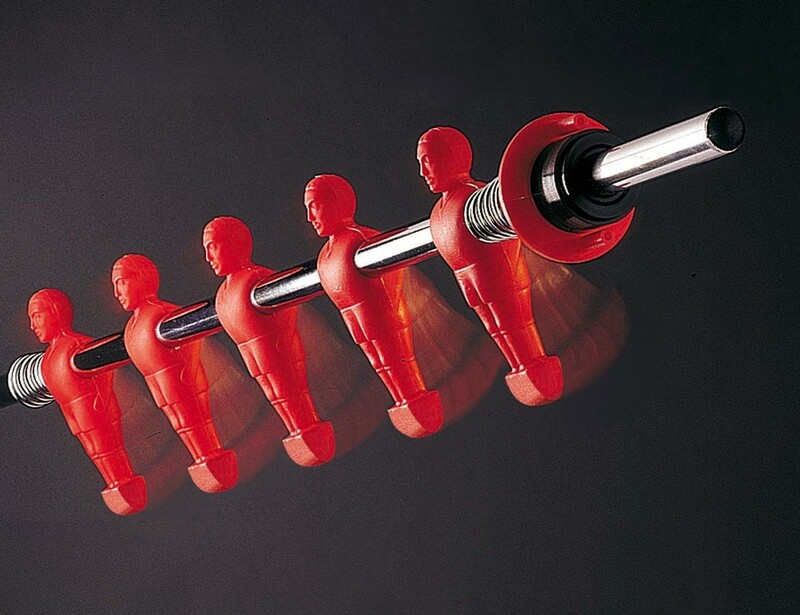 One-color players in plastic material (moplen) representing a stylized human figure, directly molded onto the bars: they do not move, cannot be displaced and maintain their positions perfectly. Team colors: red and blue. Plastic laminate playfield has silkscreened lines using a special ink to withstand sun bleaching and dampness. It is fixed to the cabinet with water proof glues. 1 1/4-inch thick cabinet walls are made of high quality marine multi-layered plywood coated with a water resistant laminate that is glued to the cabinet with a special water proof glue. All bolts, nuts, and screws are bathed in an anti-rust solution. Balls served through a filler on each table side. Quick and easy ball recovery through an exit behind each goal. Color coordinated abacus scorers. Includes 10 white standard balls. Dimensions: 104”L x 44” W (with rods); 352 pounds NOTE: Use in salt water areas requires additional maintenance. Storage in an enclosed area and rinsing with water after use are recommended.